"Now there is finally music from which a man can learn something." - Wolfgang Amadeus Mozart, upon hearing a Bach motet in Leipzig. What's in this playlist: The complete works of Johann Sebastian Bach, recorded under the artistic direction of Helmuth Rilling, released by Hänssler Classic, first as 140 individual volumes, then as a 172 CDs box-set in 2000, the 250th anniversary of Bach's death. The albums in this playlist are arranged by volume numbers, from Vol.1 to 140, and grouped by genres as listed below. The volumes themselves are arranged, though not strictly, by BWV numbers. 139 of the 140 volumes, or 169 of the this 171-CD (the 172nd CD is a CD-ROM) edition is available on Spotify. The missing ones are the Goldberg Variations, Six Sonatas and Paritas For Solo Violin and the Brandenburg Concertos. I used other Hänssler recordings of the first two works and Jordi Savall's Brandenburg to fill in the blanks. How to use this playlist: 1, Set your Spotify to Shuffle Mode, and double click this playlist. Radio Bach is on the air. Since the playlist contains over 175 hours of music, you are not very likely to encounter the same piece twice in a day, even if you play all day long. 2, If you have a particular works in mind, say BWV 1007 the first Cello Suite, go to this playlist, press ctrl (CMD) + F to bring out the filter bar, input 1007 or cello suite, find the work and play. You will hear the music within a couple of seconds after the piece comes to your mind, much faster and more convenient than going through the physical box-set, and your don’t have to spend at least 30 GB of your hard-drive to store the digital files either. The beauty of Spotify and the cloud. When I first put the completed playlist on shuffle, it played the 6-voice ricercar from Musical Offering. I guess it's like leafing through a Bible and the first thing you see is the Lord' s Prayer. Here' s the Spotify playlist: Bach: Complete Works - Hänssler Edition (3526 tracks, total time: 1 week). It works better in Album view. For those who are looking for an introduction to Bach, check out this excellent Naxos Audiobook on Spotify: Life And Works: Johann Sebastian Bach. 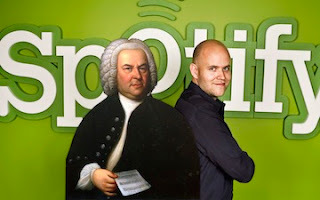 Click here for a larger photo of Bach taken with Mr. Spotify. And Hänssler, if you are reading this, please make the 5000 pages text material and two books accompanying this edition available for purchase or as free PDFs. You know that makes sense. Thank you. 2012 Update: I compiled a new playlist for complete work of Bach, using non-Hänssler recordings. Thanks so much for sharing this. I am so thrilled. First let me share my admiration for your librarian skills. Your play lists makes soptify a great source of pleasure. Now, I was looking for the Bach 2000 records (in particular Harnoncourt playing the cello suits). Teldec's catalog is partially available on Spotify. I'm not sure if it's intentional or their distributor is slow at uploading content to Spotify. I will try to find more info.